Oh it does look beary good indeed--even if there was no ham. Sigh. That was so thoughtful of Nellie... although it would have been nice if she had sent some ham too! The Mommy is all excited. But I ask you, where in the hello kitteh is the HAMMM??? What a wonderful giftie!! It is a shame there was no ham in it though. Ham Jam? Never heard of such thing! You demand your Ham Katie! How nice of Nellie to send you a parcel of some BEARY good stuff! But how can it be beary good for you without the ham? So no ham in those bottles? Too bad. It was very thoughtful though! No ham? What a letdown! Do you have a sweet tooth? Maybe you can steal some toast and jam from Gloman when he isn't looking. Very thoughtful of Nellie, we LOVES Jam here. Mommy says she is going to have to visit their website, she wants to know the ingredients in Black Forrest JAM. We don't think we'd like that sticky stuff, but the mom is drooling over it!! She says she's gonna check it out!! Do you have jam on your ham and jelly in your belly Katie? My human thinks it looks good. But what's the point of looking good if there's no ham in it? That was so nice of them! I love homemade preserves. Hmmm Ham Jam? Me wonders if Mommy could makes that? She has made bacon jam... and potted shrimp (They was both yummy) but me is not so thrilled with her sweet stuff! Mommy's best seller is Blueberry Garlic Jelly! Whoa! Look at all those jars! Nellie's Mom was so very kind to share a couple with the Glopeeps. Wonder if there's a NIP jam?? Surprises in the mail are the best! It is always fun getting food in the mail! Isn't Nellie just the BEST!! 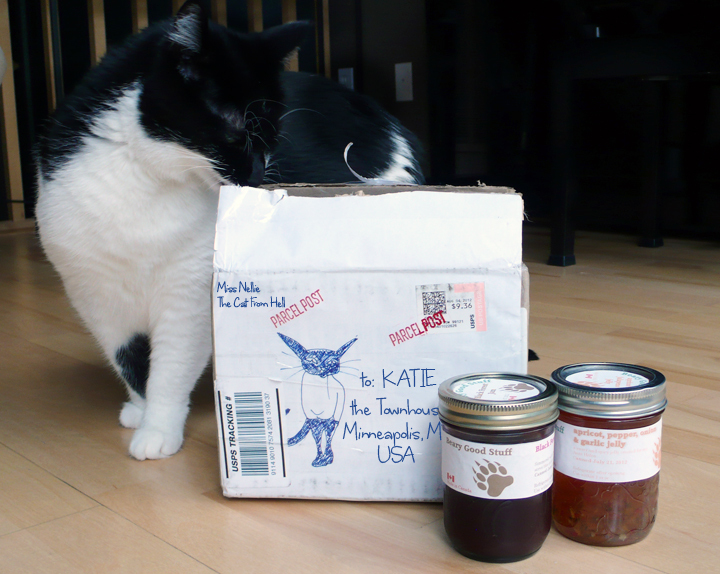 We featured "Beary Good Stuff" on Cat Chat (I think last fall or winter, can't remember!!) Nellie's Mom had sent us a few surprise jars of deliciousness as well and ohhhhhhhhhhhhhhh was my mom excited! It truly WAS "Beary Good Stuff" ENJOY! If I'm not mistaken I'm sure the package said "To Katie", right? And Glogirly didn't even put it on Salmon for you? Our mum said that was a thoughtful gift and looks very tasty. We're not so sure. 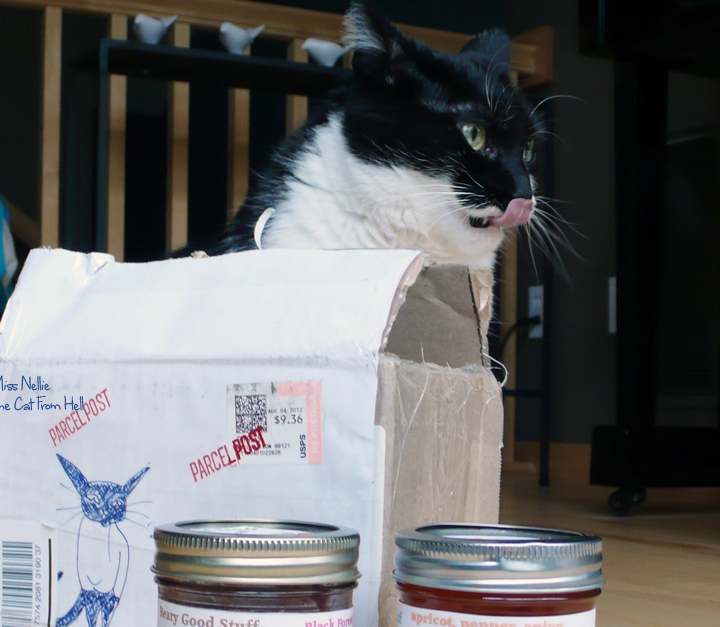 We love Nellie and those jams look yummy! Hope your pawrents brought you back lots of salmon! MOWZERS! How did we not know this about Nells' humans??!? A'course, that ham stuff is not ever at our house, bein' traif and all, but Mommy's drooling over the sweet jams! Wow that looks amazing! Too bad there was no ham....um do you think she makes cheese jam??? Me neither care much for jam ! Those look yummy but we think Ham would be better. We saw Nellie's comment and think Bacon could be good too!! We're going to go check that site out.